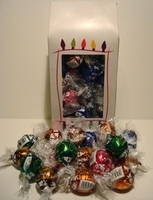 Everyone loves Lindt Lindor truffles and there are so many flavors to choose from sometimes it is hard to pick which one to buy. We have made it easy for you with our truffles assorted Christmas box. In each box you will get an assortment of milk chocolate, dark chocolate, white chocolate mint, peanut butter filled truffles and hazel nut. This gift box makes a perfect Christmas present. Each box has 34 truffles. The hard part will be trying to decide which truffle to eat first.